Maunakea, Hawaii – Taking a picture of an exoplanet—a planet in a solar system beyond our sun—is no easy task. The light of a planet’s parent star far outshines the light from the planet itself, making the planet difficult to see. While taking a picture of a small rocky planet like Earth is still not feasible, researchers have made strides by snapping images of about 20 giant planet-like bodies. These objects, known as planetary-mass companions, are more massive than Jupiter, orbit far from the glare of their stars, and are young enough to still glow with heat from their formation—all traits that make them easier to photograph. CREDIT: IRELAND, M. J. 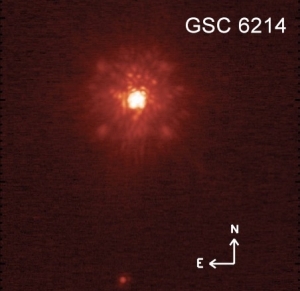 ET AL 2011, APJ, 726, 113 Image of the planetary-mass companion GSC 6214-210 b (bottom) and its host star (top). CREDIT: KRAUS, A. L. ET AL. 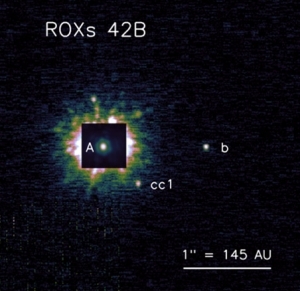 2014, APJ, 781, 20 Image of the planetary-mass companion ROXs 42B b (right, labeled 'b') and its host star (left, labeled 'A'). The astronomers measured the spin rate, or the length of a day, of three planetary-mass companions known as ROXs 42B b, GSC 6214-210 b, and VHS 1256-1257 b. They used an instrument at Keck Observatory called the Near Infrared Spectrograph (NIRSpec) to dissect the light coming from the companions. As the objects spin on their axes, light from the side that is turning toward us shifts to shorter, bluer wavelengths, while light from the receding side shifts to longer, redder wavelengths. The degree of this shifting indicates the speed of a rotating body. The results showed that the three companions’ spin rates ranged between six to 14 kilometers per second, similar to rotation rates of our solar system’s gas giant planets Saturn and Jupiter. The study, titled, “Constraints on the Spin Evolution of Young Planetary-MassCompanions,” was funded by NASA and the Sloan Research Fellowship Program. Other authors include Caltech’s Konstantin Batygin (MS ’10, PhD ’12), assistant professor of planetary science and Van Nuys Page Scholar; Björn Benneke, formerly of Caltech and now of the University of Montreal; and Brendan Bowler of the University of Texas at Austin. Scientists are investigating the nature of planetary-mass bodies that orbit stars, finding new clues to their origins.